The beautiful and elegantly designed Varres Hotel is located inland on the island of Zante, enjoying a hillside position surrounded by lush landscape and overlooking the Mediterranean Sea in the distance. It lies a short distance west of the main city of Zakynthos, providing guests with great access to shopping, restaurants, nightlife and cultural sightseeing. The guest rooms at this hotel are elegant and spacious, decorated in warm Mediterranean colours and featuring balconies with views over the resort and the sea beyond. They vary in size, with some rooms suitable for families. Their facilities include bath or shower rooms, mini fridge, satellite television, air conditioning, safe, telephone, complimentary bathrobe, free Wi-Fi access and room service availability. This hotel is the perfect choice for couples and families looking for an elegant and sophisticated holiday destination with plenty of activities to enjoy. 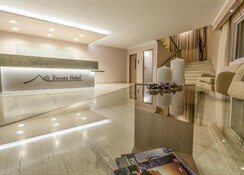 The hotel boasts a large outdoor swimming pool with a furnished sun terrace. Guest rooms are spacious and well-presented. They can accommodate up to four guests in some rooms, and there is a honeymoon suite available for rent. They benefit from large balconies with furniture, wonderful views, good sized bath or shower rooms, satellite television, mini fridges and safe, and air conditioning. 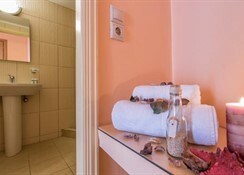 The hotel is located west of the city of Zakynthos, on the side of a hill and overlooking the Mediterranean Sea. It sits in its own landscaped and forested grounds, providing privacy for guests. Visiting the town is easy by car where guests can enjoy shopping and sightseeing just five minutes from the hotel.